California Water Restrictions MUST Include Big Ag, Big Oil and Nestlé! The mainstream media and state officials have for years tried to portray California as the "green" leader of the nation. In reality, California suffers from some of the greatest environmental degradation of any state in the nation, since corporate agribusiness, the oil industry and other big money interests control the majority of the state's politicians and exert inordinate influence over the state's environmental policies. California is currently in a state of emergency, with NASA scientists saying that California has only about one year of water left in reserves, according to Food and Water Watch. This is largely due to the gross mismanagement of California's reservoirs, rivers and groundwater supplies, during a record drought, to serve the 1 percent. California Governor Jerry "Big Oil" Brown's recent water restrictions on cities and counties are woefully inadequate. Big agribusiness, oil interests and bottled water companies continue to deplete and pollute California's precious groundwater resources that are crucial for saving water. It's clear that the severity of this drought calls for much more than just individual action like cutting back on showers. Sooner or later we have to stop subsidizing corporate agribusiness, growing almonds and other export crops on toxic land, soil that should have never been irrigated, with cheap water and other subsidies. The idea of big corporate growers "suffering" during the drought is a classic example of the "Big Lie" that has been spread by agribusiness, the Brown administration and Big Ag Astroturf groups. At a press conference in Sacramento on April 8 after meeting with water agency and agribusiness leaders, Governor Brown said that the "key is to get the water and not point fingers" during the drought. Barbara Barrigan-Parrilla, Executive Director of Restore the Delta, responded, "We have already sent a tweet asking him get the water for whom? Westlands? Paramount Farms?" Natural Resources Secretary John Laird claims that "everybody is a soldier in the fight" to address the drought. Yes, everybody except those planting almonds in the drought! "I have marked the almond acreage at the beginning and end of the 2006-2009 drought (700,000 acres at the beginning, 810,000 acres at the end). At the beginning of our current drought, almond acreage was 870,000 acres. 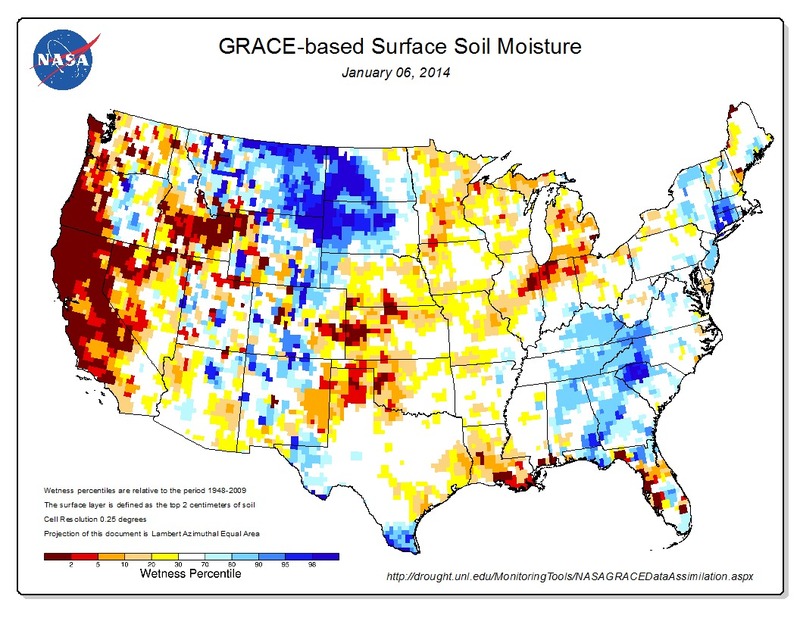 In 2013, after two years of drought, it was up to 940,000 acres. It looks like the 2014 California Almond Acreage Report comes out at the end of April (here’s 2013). I will be excited to see a new total acreage. Let’s make this all explicit. Since this drought began, almonds have expanded by 70,000 acres. That’s 280,000 acft/year of new water demand for a snack that will be exported. That water will come from groundwater or from other farmers. At the same time, the California EPA is literally telling urban users to take five minute cold showers. If there is a lot of new acreage in 2014 and 2015, it is going to be difficult for the Brown administration to stay friends with them." You can take action NOW to stop corporate agribusiness, big oil companies and Nestle and other bottled water companies from depleting California's precious water supplies during a record drought by visit this site. On March 20, environmental and human rights activists, holding plastic “torches” and “pitchforks,” formed human barricades at both entrances to the Nestlé Waters bottling plant in Sacramento at 5:00 a.m., effectively shutting down the company's operations for the day. The complete story is availaba at Daily Kos. Why is it that every article seems to overlook the wine grape agribusiness? According to todays Sac Bee a single grape uses .3 gallon of water. How many grapes per cluster, and grapes per vine times the thousands of acres right here in Elk Grove. Ironstone vineyards ones over 10,000 acres . They must have a lot of political clout to keep their water use quiet. I wonder if this drought will eventually pit agribusiness against the homebuilding industry? As it currently stands, Brown is letting one come out relatively unscathed and other will have to walk a delicate tightrope to keep public opinion on their side as they endeavor to mow down those fields for rooftops and "economic development". After all, the homebuilding industry has worked so hard (i.e. spent a great deal of money) to achieve political control at the local level, the last thing they want to have happen is to wake up the masses who may pressure their local leaders to adopt slow growth policies. Rural Elk Grove and Wilton rely on ground water for all of their basic needs. We are all on wells. Almonds are not an issue in our region, grapes are! As a follow -up on the Sacramento Bee article claiming .3 gallons of water per grape. Let's do the math using conservative numbers. 75 grapes per cluster (22.5 gallons), 40 clusters per vine (900 gallons) 500-1300 vines per acre. Let's use 500 vines per acre, very conservative, equals 460,000 gallons of water per acre. Ironstone Vineyards ( Kautz Family Vineyards ) owns about 8000 acres of grapes in the Elk Grove region. Our County Supervisors appointed Kurt Kautz to the board of the Omochumne- Hartnell Water District along with other farmers like Robert Mahon. The Omochumne-Hartnell Water Board oversees the Consumnes River and Deer Creek areas for the benefit on agricultural users not home owners and families living in this area. The fox is watching the hen house.